When St. Mary’s senior and triple major Enrique Torres Hernandez was a young boy, his father told him something he never forgot. It was a lighthearted comment, but one that the small boy took seriously, developing in him an obligation to provide for his family. 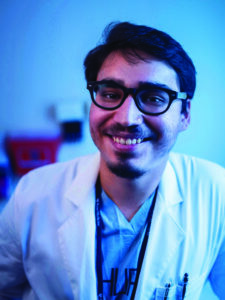 That formative experience created a strong drive in Hernandez, who is a senior Economics, Political Science, and Mathematics major, plus studying Pre-medicine. His parents, both from Mexico, migrated to San Diego, where Hernandez was born, and then to Arizona. His parents worked hard, but times were tough. Hernandez recalled one Thanksgiving when his family had enough money saved to eat burgers at a fast food restaurant. It was a special outing – a happy memory despite hardship. Hernandez knew he would need financial assistance for college, and St. Mary’s offered a full scholarship. Hernandez packed his bags and flew to Texas — his first time on an airplane. “I had only the vaguest image of Texas, nothing but deserts and cowboys,” Hernandez said. His intention was to go to law school, so he started out as a Political Science major, later adding Economics and Mathematics. But after a few science classes, Hernandez began to realize his true calling: medicine. In summer 2015, Hernandez was accepted into a biomedical research internship at hospitals with the University of Pennsylvania. The internship is typically only for Biology majors, but Hernandez won over the internship director after reaching out to her and telling his story. Hernandez shadowed intensive care units to observe patient handoffs with the goal of understanding of why some patients experience “sentinel events” — simply put, an unexpected death or serious physical or psychological injury sometimes caused by clinical miscommunication. Hernandez evaluated clinicians’ body language and recorded their conversations during patient handoffs, which were hectic, lasted just a few minutes and often omitted important information. From these observations, he helped develop guidelines to improve communication processes. He plans to publish his research later this year, which he hopes will reduce clinical errors and potentially save patients’ lives. Soon after returning from his internship, Hernandez received a devastating phone call from his dad. He learned that his aunt, one of his big supporters, had passed away from a cancerous tumor in her heart in September. Years earlier, when Hernandez was 12, his aunt’s daughter had also died from cancer. Hernandez is slated to graduate in 2018. In the meantime, he’s trying to make the most of his educational opportunity as he prepares for medical school.